IlyaM: I played following 44PointLowApproachTenuki joseki as white in my last game. Black played what as far as I know is not joseki. At least my db searches didn't show this move. As I understand it should be played in instead. I am interested to know why it is not joseki. In my game I played as shown what ended in disaster after black's cut at 'a'. Rich: Well, there's the minor benefit of cutting black in two... ;) To the OP - how did it fall apart? It looks playable to me (perhaps playing two points below a), but I may be missing something. Rich: Sorry, my mistake; I thought you were black! I couldn't see the problem. kokiri perhaps it is enough to simply play , or a. 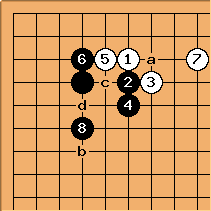 Then black must choose some defensive move, giving up sente, or leave the huge cut. Often trying to punish a 'mistake' to hard is a far worse error than deviating from what is considered best play. ThaddeusOlczyk: I think exchanging b for c first is a good idea. If costs nothing,( It is sente, and at worse the stone can be sacrificed. ) and it ruins Blacks good shape. IlyaM: Hmm, does it really cost nothing? Can it be aji-keshi? ThaddeusOlczyk: Keshi, yes it removes the bad aji ( at d ) that White has. Even more reason to play it. 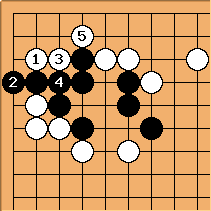 As for Black, if ruining your opponent is aji-keshi, then we should be playing as much aji-keshi that we can. Bill: W b is indeed what is called a no-cost kikashi?. It not only gives Black bad shape after B c, it prevents B d. It also makes W e non-urgent, because White can consider a kikashi stone and treat it lightly. ThaddeusOlczyk:Bob I think you are confused. is what is claimed to be the "book" sequence, not the sequence that we are discussing. In that sequence is played at . It changes somethings aji-wise. For one thing, as long as is not played, the aji does not exist since Black can play . Technically I suppose that the play is aji. Yet I see either or b as important, My preference would be to play b rather then . ThaddeusOlczyk: This is a perfect example of why weak players should not learn joseki. Joseki are not about playing a fixed set of moves. Rather they are about learning the basic shapes that go into a sequence, and the way to use their strengths and weaknesses. IlyaM: I disagree. While I ruined *this* game by dumb attempt to punish non-joseki move my joseki study helped me win many other games. Did they help you win other games? Or did your opponent lose those games? IlyaM: Joseki knowledge often helps me to get better fuseki what obviously leads to easy middle game. Bob McGuigan: I think IlyaM's question is exactly the sort of joseki study that's helpful at any level. The idea is not just to memorize move sequences but to understand why each move is good or bad. You can make things up as you go along if you know enough about the game, after all there are no joseki for a meijin. 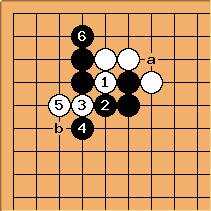 But you can also study shape and tesuji and opening theory through truly understanding joseki sequences. ThaddeusOlczyk: I never said that the question in itself was not worth study. What I said was that IlyaM's approach to joseki was wrong. Reading his question, it is clear that his approach is to memorize, then try to punish a person when his opponent deviates from the sequence. The rest reflects the sentiments that I have expressed here. IlyaM: Thaddeus, I'm thankful for your analyze of this position but your ideas about my study approach is really off the mark. My current way to study josekies is a) doing excerises in GetStrongAtJoseki b) do post mortem analyze of new positions I've encountered in my games using game databases, my own brains and help of better players when I'm not sure about meaning of joseki moves. This is why I posted this BQM after all. I'm not sure how it follows from the fact that I incorrectly tried to punish non-joseki move that I'm only try to memorise josekis. dnerra: Thanks Bob for expressing what I felt when reading Thaddeus' remarks. Thaddeus, excuse me, but I find your attitude patronizing. I see no reason whatever to assume that Ilya is tring to memorize joseki sequences without understanding them. What better way is there to study joseki than to try to understand why another move is not joseki, and to ask stronger players what went wrong after your position fell apart in a joseki? 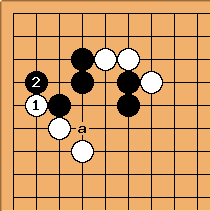 Let us first examine the single kakari version of the attach-block joseki. Bill: First, this is not an attach-block sequence, but an attach-stretch sequence. Second, it may have been joseki in 1890, but not in 1980, and not now. Black is overconcentrated. ThaddeusOlczyk:Not memorizing joseki, I don't memorise names either. The result is that I sometimes misname things. This is the attach and extend joseki or tsuke-nobi. It is indeed overconcentrated, but joseki books still list . They then go on to say that it is overconcentrated. I personally am a coward soI play b, but the extension should be further. Indeed, it is one of the subchapters of the The Breakthrough To Shodan. protects against the cut at a. protects against the cut at d after the push-through at c. Often times White makes go one line further. People also suggest b or even further for . In both cases, a balance is maintained between length of extension and security from the respective cut. 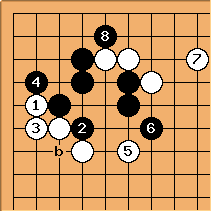 Let us now return to the original joseki. It is obvious that with the choice of that Black chooses to defend the corner and if necessary will allow his group to be split into two. Let us now examine the actual split. This is a fight that W cannot win. Two vital points are a and b. W cannot cover both at the same time. As a result the push and cut does not work ( with the usual caveat that such situations can change with surroundings ). 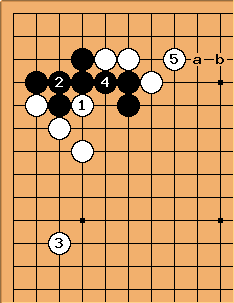 In this circumstance, The Black group on the left has fewer liberties than the group in the single kakari case, but it has better chances of making eye space. At worst, the cut at a buys Black an extra eye and a few more liberties. The White group on the left is heavy with bad shape, the group on the right has a serious defect at b. Yes, the central black group is moderately heavy and is not well shaped for eyes, but it has two groups to puch against. Is there anyone who would not choose that fight? dnerra: Sorry, but I don't think it is so easy. The only way to judge this situation is to read out what happens after the Black cut at b (which is the only chance for Black to get a reasonable result here. What to do? Most of all remember the defect at a. 1 is not necessarily a bad move. It is sente and creates a light shape. Then defend at 3. What to do afterwards depends on the global situation. The biggest thing to remember is that joseki are not a set of moves that are played by rote. Joseki are about shape. dnerra: Good point. For example, I think would be better one space to the left here. With this shape it is the case that a is a defect in White's shape. That the cut b and push c are generally not a good idea. What is more, unless your opponent is thoughtlessly slaming down stones he has considered the cut. 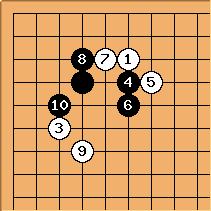 ( It is not as if this joseki will come as some great revelation. ) The one question is do stones around modify the situation. The answer is that they make the cut at c even nastier for W.
White cuts black in two. What is the difference between the two diagrams? 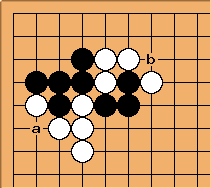 Black has a stable corner in both diagrams. At most he loses three stones, which he should be happy to sacrifice if necessary. The central influence of the Black stones in the first diagram is small, they are not positioned well to exert such influence. 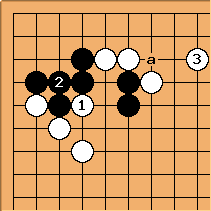 If it really worries White, he can play a stone somewhere around a-e. 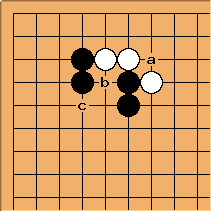 In the second diagram, it is not just Black which is cut in two, it is also White. 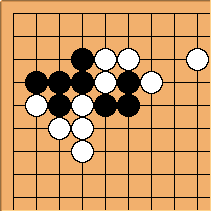 And it is less painfull for Black to lose his stones, then it is for White. These Black stones also give White significant bad aji. So which diagram is better for Black? Bill: I think that this diagram is good enough for White. The difference between it and joseki is small, but a palpable advantage for White. 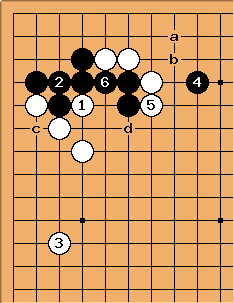 White has played on both sides, and her stones are working together. Black has bad shape. ThaddeusOlczyk: Is really what you would play? Longer extensions like a, or even b cover the cut but seem to work as well. The same as the situation for Black covering his cut. 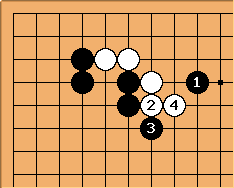 I also don't think there is any reason for Black to play untill White covers the cut. jantiff: Suppose Black wants to attack from the top and plays the usual checking extension at . 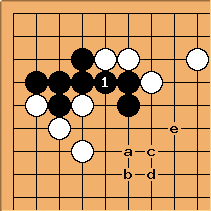 After White pushes up, the hane of is difficult since White cuts in sente, leaving Black quite heavy. Black's attack lacks force. ThaddeusOlczyk:I'm not sure the hane makes sense for Black. Black can simply connect at . 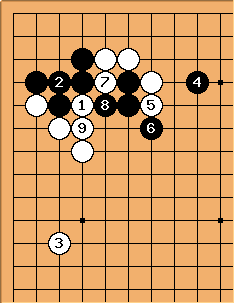 Since the stones are connected d doesn't seem to be a good attack especially since White still has to defend at a or b since makes the cut more uncomfortable for White. I also have to admit that I've never seen before. In fact I might just play at , forcing W to defend the cut, then play at (depending on how loosely W defended). jantiff: A Black play at pushes from behind, which is something you'd better have a good excuse for. ThaddeusOlczyk:One thing that people should keep in mind. This started as a double kikari. That means that Black got to play tenuki. So to expect something extremely good for Black is unreasonable.